Digital extraoral x-rays are typically taken to see problems with the jaw or the skull. 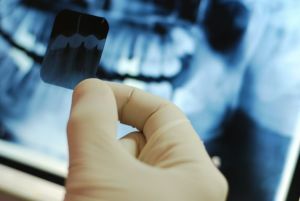 These X-rays are not as detailed as intraoral x-rays but are good for identifying impacted teeth, development of the jaw and help diagnose TMJ disorder. Used to image the entire mouth. Typically used to detect the position of fully emerged teeth as well as find emerging teeth. With tomography structures in the focal plane appear sharp while everything around them is blurred. It is typically used for dealing with particular layers of the mouth. These x-rays show one entire side of a head. These are helpful for profile shots and can help determine how teeth are in relation to the jaw. A process that involves injecting a dye into the salivary glands so that they are visible on x-ray film. This is only used to look for gland issues. "Thank you for the great crew, great practice, great service and for always putting a GREAT SMILE on my face!"